The first screening of 3D footage from Ridley Scott's sci-fi epic Prometheus took place earlier today at the Vue cinema in London's Leicester Square. The first impressions are now filtering out online & we have collated some for you. A total sneak peek of 12 minutes of footage was screened in 3D & a Q&A followed with director & some of the cast in Noomi Rapace, Charlize Theron & Michael Fassbender. Hit the jump for the details but be warned the details are very spoiler heavy. Empire: "1. Prometheus is an Alien prequel. 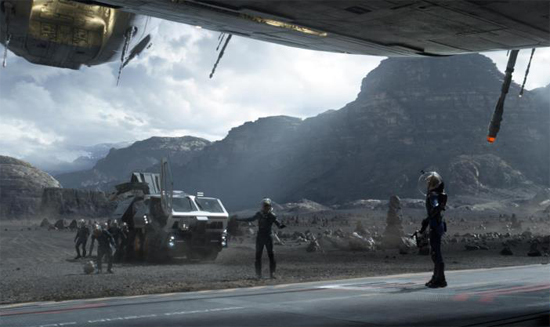 Make no bones about it – Scott has frequently said that there are direct connections in the last eight minutes of the film, but for Alien fans, Prometheus will have Easter eggs galore. For example, we learned that the planet on which much of the action takes place is designated LV-233. Just a stone’s throw, astronomically speaking, from LV-426, home of Alien and Aliens. 2. Another connection comes in the subtitles informing us about the Prometheus, as Scott did with the Nostromo. It has a crew of 17 (ten more than the Nostromo), it is very, very far from Earth (if we recall correctly, 32x1014 km from Earth, which is approximately 32 HUNDRED TRILLION kilometres from our home planet. Quite a way to go.). It is December 21, 2091. Its destination is unknown. 4. Which, as it turns out, represent the exact configuration of a solar system a long way from Earth (about 32 hundred trillion kilometres, as it turns out). Holloway and Shaw have been studying similar cave paintings from different civilisations, none of which could have known each other, and have discovered that they are, in fact, a map to the aforementioned solar system, which has a sun much like ours, and a moon orbiting a gas giant that is capable of sustaining life. So, with some heavy-hitting financial backing, away they go. 5. In 2089, camping equipment and clothing hasn’t changed that much. Holloway and Shaw still look like they’ve just shopped at Millets. 6. On Prometheus, Holloway favours flip-flops. 7. Prometheus also feels like an Alien movie, down to the hustle bustle of activity on the Prometheus as the crew come out of cryo-stasis. There’s even a brief moment where some people are eating dinner around a table – but there’s no fear of a chestburster here. At least, not yet. 8. Speaking of chestbursters, Scott and Rapace were asked if there was a moment on set that rivaled the chestburster scene – where Scott, famously, didn’t tell his actors the exact specifics of what was about to happen, hence their genuinely shocked expressions. They said no, but Scott confirmed that there is a scene, involving Rapace’s Elizabeth Shaw, that might rival it for visceral impact. Rapace added that it was hard to get the horrific images of that scene out of her head for a while after filming. 9. The film, thanks largely to Scott’s insistence on shooting much of it practically on giant sets, feels real and lived-in, although it doesn’t have the grimy, claustrophobic feel of Alien. Prometheus is a state-of-the-art flagship, unlike the Nostromo, and its bells and whistles reflect that. Prometheus, the film, feels more pristine and lush to look at than Alien. But we expect things are going to get dark and spooky very soon indeed. 10. The opening spacescape shot – a silent canvas of awe-inspiring stars across which the Prometheus moves at a fair old lick, creating a light-wake behind it – is stunning. In space, no-one can hear your jaw drop. 11. Guy Pearce was confirmed as Peter Weyland, head of the Weyland Corp and the man whose mega-millions fund the Prometheus expedition, in that TED viral that came out a couple of months ago. That, however, took place in 2023, a full sixty years before the events of this movie, and saw Pearce play Weyland in his forties, unencumbered by make-up. Today, though, confirmed our theory that Pearce also plays Weyland in old age make-up. As Prometheus comes out of orbit, its assembled crew are treated to a holographic lecture from Pearce (accompanied by his playful dog, who rolls over at one point), who informs them that he is: a) their employer, b) dead now and c) the ‘father’ of Michael Fassbender’s David, the ship’s android. Unfortunately, David has no soul and so cannot appreciate the gifts that Weyland has bestowed upon him. He once again invokes the Prometheus myth, in which the Titan Prometheus stole fire from the Gods to bestow to man, triggering our evolution. He was roundly punished for this, but Weyland appears to be ignoring that part, and is placing great importance and significance on this mission, hoping that it will yield a giant step for mankind that can see them stand shoulder-to-shoulder with the mysterious race that ‘invited’ them. 12. However, if Pearce’s Weyland is dead, then who’s that old man who can clearly be seen on board the Prometheus in the trailers? Is Weyland secretly stowing away aboard his own ship? If so, who knows about it: his direct employee, Vickers (Charlize Theron)? Fassbender’s David? And why is he there? Could he be looking for the secret of eternal life? Might this explain why Scott chose an actor in his 40s, rather than someone in his 90s? Will we see Weyland ‘de-age’ at some point? 13. Theron’s Vickers is – at least at first – cold as liquid nitrogen, and hard as nails. While all other crew members have to be forcibly awoken from cryo-stasis, and then spend most of their time heaving their guts into a space-bucket while their bodies adjust, Fassbender’s David – who, as an android, doesn’t go into cryo-stasis, bustling about the ship on his lonesome during the two-and-a-half year journey – finds that she has roused herself from cyber-slumber. Following a trail of wet footprints, David finds Vickers in her chambers. Rather than being violently sick, she’s already doing push-ups, while dripping with viscous fluid (which explains the shot of a stressed-looking Theron lowering herself onto something from the trailer). She then barks orders at David – “Robe!” – and demands a status update from him. “Were there any casualties?” “No, ma’am, everyone’s fine,” replies David. “Well, then, wake ‘em up,” she orders. It’s clear that, while they’re both technically Weyland employees, Vickers wears the trousers around here. 14. David, meanwhile, is a calm and fastidious presence. He is the first character we meet on board the Prometheus, wandering its corridors while waiting for the ship to reach its destination. At one point, the ship is jolted by something, and rocks slightly (in a nice touch, futuristic pool balls slide around a table as the ship tilts to the right), but David just waits, calmly, for the situation to be rectified before carrying on with what we reckon is his daily routine. – A shot of the besuited scientific crew in the docking bay of Prometheus, with the planet’s rocky, windswept landscape glimpsed behind them. – A shot of a solemn Vickers, intoning, ‘if you go down there, you’ll die.’ She may not be wrong. – An extended shot of something – a microscopic worm – wriggling into Holloway’s eye, back on board Prometheus. Does he become infected by something? – And the piece de resistance, a brief shot of a living organism – a tiny thing which, true to form for this franchise, has a mouth that is redolent of female genitalia – rearing up, presumably while the Prometheus crew is completing their first sweep of the planet. What does this mean? It’s not a facehugger, or an Alien, but something else entirely. Is it about to attack someone? Will it end well? I think we all know the answer to that. 17. The issue of certification was brought up once again during the Q&A. Scott, who was on fine, funny form throughout, said that his preferred certificate is “Whatever guarantees me the biggest box office possible”, and demanded that the MPAA get their act together. Sounds like this one is going to be a PG-13 in the States, but could well be a 15 over here. 18. When asked about his first foray into 3D, Scott was also hilariously blunt. In short: he found it almost ridiculously easy. The 3D, by the way, looks excellent: the space sequences have a wonderful depth of field, and we can’t wait to see what happens later in the film, when all manner of nastiness is unleashed.19. June 1 can’t get here soon enough." TotalFilm: "First up was a sequence set on Scotland's Isle of Skye, in which research scientists Noomi Rapace and Logan Marshall-Green discover some peculiar markings on the wall of an old cave. Surmising that the etchings make reference to a race of extra-terrestrial beings, Rapace make the fateful proclamation that, "I think they want us to come and find them." The next scene was set upon the good ship Prometheus in the year 2093, with Michael Fassbender's placid android, David, attending to a pushup-performing Charlize Theron. "Were there any casualties?" she asks him casually, as she completes her workout. David confirms that there were not. She's referring to the awakening of the ship's research crew from their stasis chambers, having spent a whopping two and a half years in there before being roused. Straight off the bat it seems as though Theron's character, a suit from the Weyland Corporation, is a very cold fish indeed. Intriguingly, Theron revealed after the screening that her character is initially detached from the mission, but has actually got a very personal reason for being there. We're briefly introduced to various crew members (including Idris Elba's scene-stealing badass, the pilot, Janek) before a hologram of Peter Weyland introduces the lead scientists and congratulates them on the mission ahead. As suggested by his TED talk, it's to be one of discovery. He also makes reference to David the android, describing him as "a son" before referring to his absence of a soul. David looks a bit hurt. It's then the turn of Marshall-Green and Rapace to explain the mission ahead, referring to their cave-based findings and revealing their discovery of a planet with its own moon, capable of sustaining life. That's where the crew are heading. Sean Harris makes a snide comment scoffing about the veracity of cave paintings, leading us to believe his card may well be marked…The final sequence showed us Prometheus coming in to land on the aforementioned planet, with Elba revelling in centre stage, firing off one-liners and generally chewing the scenery to great effect. It was probably the most visually arresting sequence in a film that promises to be extremely easy on the eye." Courtesy of TotalFilm. Prometheus stars Noomi Rapace, Michael Fassbender, Charlize Theron, Idris Elba, Sean Harris, Kate Dickie, Rafe Spall, Logan Marshall-Green & Guy Pearce. Arriving in 2D, 3D & 3D IMAX theaters this June 8th in the US & June 1st in the UK. I'm reading: New 'PROMETHEUS' Details Revealed in Private Screening of 12 Minute of Footage! [SPOILER HEAVY! ]Tweet this!